Its been nearly 9 months since Ive had a full time job & now that Im back in the workforce, I have to admit it feels awesome. I was honored with another Liebster Award and have nominated another batch of new blogs that I find fascinating and downright fun. Some have since mentioned they have also been nominated multiple times so my congrats go out to all of them. In keeping with the terms of the award, my answers are below and I give many thanks to Kallia’s Everyday Talks for the honor! What is your fashion/ style icon? I would say anyone that walks with confidence. Style is more than what you wear, its how you wear it and how you carry yourself. What is your biggest regret? Not getting to know my mother more as a woman than as a parent before she passed away at age 59. If you could change one aspect of your life, what would it be? To wake up without debt and be able to support my family without the burden. What is your thought process when you write a blog post? It changes each time depending on the content. If there is a holiday, event or if something inspires me, the process is different. Where is your favorite destination? I haven’t traveled much so Catalina is my fave so far. Only 26 miles off the coast of California but a world away. The three things, that are a necessity for your daily routines. Prayer, coffee & my husband. What is your favorite movie? I have a few. Holiday movies like White Christmas and A Charlie Brown Christmas are musts. Dramas like Forrest Gump and Steel Magnolias are near & dear to my heart. Brat pack movies like The Breakfast Club and Pretty In Pink are part of my youth. Of course classics like the original Ocean’s Eleven, Mildred Pierce and 12 Angry Men too. Chocolate cake or Fruit Pie/ Cake? I would prefer a good french apple pie over chocolate cake but tres leches is yummy. Then again so is a good chocolate flourless cake with ganache. Goodness…I must want sweets because they all sound good! What is your favorite perfume/ cologne? Burberry Touch is my signature scent. What would you say to your younger self, if you could? Be patient, see people for who they really are and take care of your own journey. What is your favorite memory? All of them…even the sad ones. They made me who I am today. The good brought joy, the bad brought strength and the dailies allowed me to stop & appreciate life. For those who have not yet heard about Influenster and their amazing opportunities, I encourage you to check them out. I was selected to receive their next Custom VoxBox with Maybelline products. If you are into brand influencing, giveaways or freebies, you need to check it out. The last VoxBox was amazing and had so many products. Check it out and let me know your thoughts. Cheers to all & Happy Valentine’s Day from Cappuccino Connected! I was nominated for the Liebster Award by Rebecca Lemke from New Crunchy Mom. Many thanks to her for recognizing my efforts in sharing a bit of myself with all of you through Cappuccino Connected. The Liebster Award is a new-comer award given by bloggers to other bloggers. It creates a great platform for new blogs to be discovered and build communication. The best thing about this award is that it creates a lot of encouragement and support within our blogging community. What is your favorite snack or drink? I am a coffee drinker so my favorite cold drink is the Starbucks Vanilla Latte that I buy at the market. Its pre-mixed and a great option when you dont want hot coffee. What is your favorite book? I am a fan of food, biographies and true crime so its hard to nail down a single one. If I had to pick one, I think my Rick Bayless cookbook is my fave. Who is your biggest fan? My husband. He is so supportive and positive. He is always cheering me on, telling me he is proud of me and encourages me to continue. How do you deal with writer’s block? I get inspiration from other blogs, their social media posts and all the new items on Pinterest. What is the craziest comment you’ve ever gotten on your blog? I think the first time someone reached out to me for a product review was crazy…I had just started and was excited but overwhelmed. Who is your favorite blogger that you follow and are inspired by? Gosh, how can I answer? This changes almost everyday simply because there are so many out there. I have to say the latest is Danielle from My Snippets Of Inspiration. What is the hardest article or post that you’ve ever written? My first one…I was so nervous but now 80+ posts later, those nerves are long gone! What is your goal for your blog in 2016? I would like to post 5 days a week, follow at least 10 new blogs per week, increase my blog’s visibility across social media, and learn more each day. What do your family and friends think about your blog? I hope they enjoy it! I have received loads of positive feedback and I could not be more grateful. What is your favorite thing to blog about? I like to list things…seems to be an easier and more engaging read. If you could interview a celebrity to blog about, who would it be & why? What social media accounts do you use to drive blog traffic & what are their links? How often, if at all, do you change or modify the look & layout of your blog? Have you written posts to schedule them in advance? What goals do you have for your blog in 2016? Would you or have you already done a guest post for another person? What do you find encouraging when viewing other blogs? Will you follow and support your fellow nominees? If you could make blogging easier, what would you do? Many thanks again to Rebecca Lemke from New Crunchy Mom for the nomination! When you have a fun or quirky main squeeze, the overly mushy cards and sentiments can be off putting. Not to say there isnt a time when those ‘cant live without you’ cards wouldn’t be appropriate. Its just that there are times when you want to be lighthearted and prefer whimsy over deep emotion. I have collected a few images that would go well with a hug, a smooch and a laugh. Hope you enjoy! Cool Mom Picks nailed it with the Wine theme. Hearts And Laserbeams shared a super cute and yes, cheesy, sentiment. Can you see yourself sharing this with your love? Get it? See? Well Mother’s Niche provided this clever option. Mashable posted this adorable image that was originally taken from an Etsy account. Another great Etsy card that has you saying Tomatoes in your head. Admit it. You did. How cute is this dino humor from BlogLovin? Custom Made keeps it simple and downright sweet with this greeting. In keeping with the Valentine’s theme, I want to extend an invitation to not only follow me across social media, but to share the love with others. Lets share our links and social media info to support one another and grow our networks! …and include all active social media accounts. Post your info below or connect with me at any or all of my social media accounts. 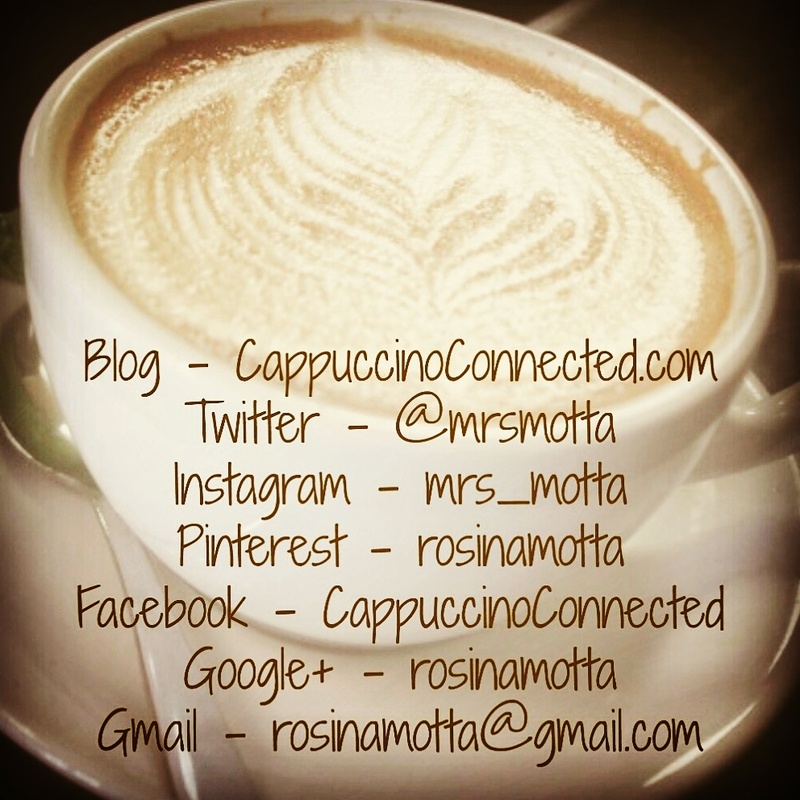 Sharing social media love from Cappuccino Connected! Ahh love. The holiday we celebrate chocolate, flowers & jewelry with our main squeeze is just around the corner. Between gift giving, dinner reservations and showering each other with amor, we may forget that its not just about the two people with hearts & stars in their eyes. For those with children, its about celebrating the family unit. Not everyone can get away for time alone and frankly, some may prefer to include their kids in celebrating Valentine’s Day. I have compiled 5 ways to have a family inclusive holiday with ideas on how to make it fun & creative. Babble shared 14 Valentine’s food hacks that are just sweet and fun to share with the family. Imagine the fun of dipping marshmallows in chocolate together, or cutting the heart shaped fruit for dessert skewers. One Creative Mommy took it to another level with a hair tutorial. We take such care in how we look on holidays, so its a no brainer to spend that extra time to have your kids looking festive too. If your kids are little ones, imagine the cuteness overload in making these thumbprint Valentine’s cards shared by Love Bugs? Making them is part of the fun. Framing them as a keepsake is priceless. Whether going to a park, setting up camp in your living room or heading to your own backyard oasis, these picnic hacks are so fun to share with the family. I kinda want those cup salads now. Turning your home into a sea of Valentine’s festivity shouldn’t cost a boat load of money. I came across these floral hacks that can be put together quickly and on a budget. You dont have to spend a lot. Just head to the dollar store for a couple vases, some colored beads and add some flowers. Love it!